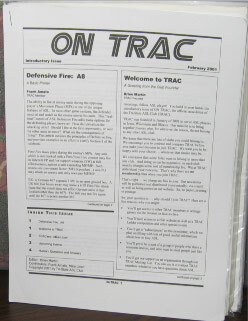 On TRAC was a short-lived ASL newsletter edited by the founder of the Tri-State ASL Club, Brien Martin, a small ASL club for residents of Iowa, Wisconsin, and Illinois. Content included standard ASL newsletter stuff: local ASL news, the occasional article, tournament reports, etc. It apparently only had two short issues in early 2001 before folding.